eco-magic | QuantumPhoenix.net – Esoterica, Paganism & Ritual Magic. 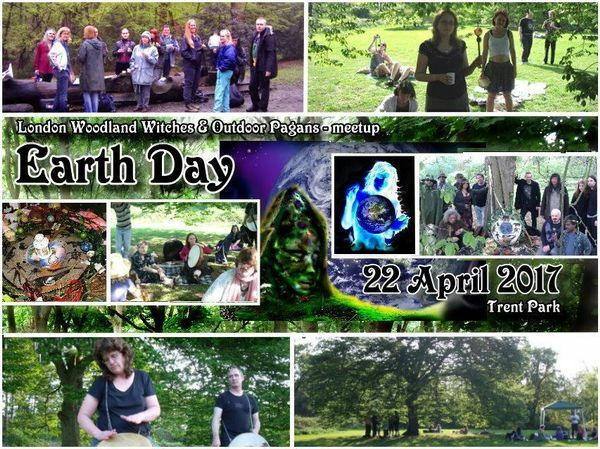 So join us on this special day.. for a family friendly social, picnic, drums, dances, facepaints..and that all important Eco-ceremony ! Takes place in Trent Park- one of London’s biggest woodland areas open to all.. with acres of space, free car park, cafe, toilet facilities. We are usually within easy reach, at our `usual spot’ to the left open ground area of the `Cockfosters Gate entrance! Time: 1pm onwards (car park gate shuts at 5pm..but people can stay much later). • Bring family & friends (all religions welcome. This is about Earth). What you can do:Please share this event and promote Earth day & Eco-Activities. History: Earth Day 22nd April- has been celebrated and marked by people of the world for over 40 years (since 1971). It provides a focus for hundreds of initiatives and activities.. from Eco-based fundraising, environmental campaigns, creating educational activities for those unaware of Earth’s ecological & environmental problems.. to magical or spiritual ceremonies to connect with Gaia“ the earth goddess/ spirit! A call to all Eco-Magicians – to invoke the Tamesa Serpent..
(Ceremony for protection of water / sacred land by Standing Rock, USA). As many will know by now …the proposed oil pipeline to be built under the river (Dakota, USA) has now been stopped. After months of fighting, gathering, standing together at Standing Rock.. many are happy for this victory. However we all know `the system’…we know `the authorities’…and we know all about the cleverness of the multibillion dollar corporate & commercial organisations! They will not give up so easily! Already there are reports that some of those oil companies are just declaring that they will pay the daily fine of $50000 and keep on drilling etc. And many fear that Donald Trump (USA President Elect) will reverse Obama’s decision..once Trump himself gets into power…because he has millions invested in those companies himself. Others fear this is just a stalling through winter..and the drilling etc will resume in full force…supported by more cunning backup plans.. in Spring 2017. When i first proposed to do a `Tamesa invocation ritual’ on 14th December ( I said that on 24th November)..the battle at Standing Rock was still going on. Now it seems to be over.. Victory seems to have been gained. While not wanting to be negative about this.. as a Magician.. I also have to listen to my intuition.. It tells me that a) Magic is not linear…and b) we must stay on the cause…not just for sake of Standing Rock in USA..but for all the Fracking that’s proposed in UK.. So this ritual will go ahead..on wednesday evening 14th December 2016..by the banks of River Thames…in Central London. The Tide will be low around 8.30pm…so That’s the perfect time for this water ceremony.. Whatever magic we do and add to the waters of Thames.. will then be there as Tide comes in..and takes it away that night..and spread through the oceans..! Water connects the whole world.. water *is* most of our bodies.. As part of the ceremony.. I will be using waters collected over the years from various parts of the world.. I have small amounts from Australia, Niagara Falls, River Nile, Glastonbury White spring.. Feel free to bring waters from your local areas… We are merely helping the water spirits from across the globe to connect and strengthen..
With it..we’ll invoke the powers of the Tamesa Serpent/ Dragon (I’ve been doing Dragon magic for 20 years, and working with Thames energies for 10 years…so I hope those will come to our aids magically). The ritual will be simple.. But it will take our mental and magical focus.. This is NOT a social.. This is Magic..this is work for us Magicians! Metering point: Tate Modern Green (Meet by the Green area outside Tate Modern Gallery from 7pm. What to bring: Wear suitable outdoor warm/ dry clothing ..especially shoes/ boots with good grips as it gets slippery by river bank (als there may be sharp objects washed up). Health & Safety: You must take full responsibility for your own Health & safety. This event is NOT suitable for children due to the slippery/ water environment at night.